Some of you may recall that I recently revisited my local wildlife stomping ground only to find that the local Council workers had moved in and chopped everything down, and dredged up all the silt at the bottom of the water, that contained all the larvae, eggs and what not of the local insect life. I was most disappointed but, I know it will come back in time. Whilst I was there I was met by a really nice guy and his wife, his name is Rob and he is a volunteer who tends the wild patch. He basically, from what I can tell, keeps the place generally tidy by litter picking, and the odd bit of pruning here and there. Whatever he does, he does it very well and I and the local Flora & Fauna thank him. Anyway, we got chatting and before long I realised that this chap had a great in-depth knowledge of wildflowers. He asked me if I had seen the wild Orchid in the meadow, I told him I hadn’t and he started to explain where it was and how I should find it. The he suddenly said…Oh come on I’ll show you, he asked his wife if she minded and we left. We had to walk only about 500 yards or so to the meadow (thats the polite word for the couple of acres of scrubland, that is full of wildflowers). Finally amongst a whole bunch of grass and stuff, there was this beautiful flower. It wasn’t what I had expected because I didn’t know that Orchids grew in this shape. Rob went on to explain that he hadn’t managed to identify it yet, that he thought he knew all the Orchids but he couldn’t name this one. I thanked him for his time and I took a couple of pics. Before he left he said oh by the way, on the other side of the road as you come in there is a another smaller stretch of wild area with a pond that hasn’t been disturbed for ages, you may find your Dragonflies and Damselflies there. So that was quite a few weeks ago now and I really have been bogged down and haven’t had the opportunity to go there until Sunday past. Imagine my joy to see simply loads of insect life abound, including some beautiful Dragonflies. I am hoping to get down there and spend a little longer next week, I shall keep you posted. And then just one pic of a Southern Hawker Dragonfly from the other wild area. I know that I have mentioned the illegal trapping of songbirds in Cyprus before. However, I have received today the following YouTube clip which really is barbaric. I have also included on my blog a place where you can sign a petition to stop this slaughter. If you wish you could also put the petition onto your blog and we could get even better coverage of this hideous practice and do some small thing to save some of our wildlife for the future. As I live quite near Rogiet Countryside Park I often nip down there just for an hour, to see what is happening. Whilst I was down there in the summer something gave me a good old bite on the leg, through my heavy duty trousers. I didn’t feel it at the time but when I returned home I found that I had three quite large bites on my right calf. So that was about the end of August. I am still trying to get rid of them, I think I am on my third lot of different ointments and potions! But there are some really quite nice and quite aggressive flies down there so I guess I will have to take more care in future. This was a shot of one I saw today, I haven’t ID’d it yet but thought you may be interested. Could this be the baby that bit me? Firstly apologies for not being around very much lately, but that damned Shingles still has me by the armpit! I must say it is improving, but Doctor says expect another three weeks…cheers doc! The shed door experiment failed miserably, the old scrumpy didn’t attract even a fly, so it’s back to the books. 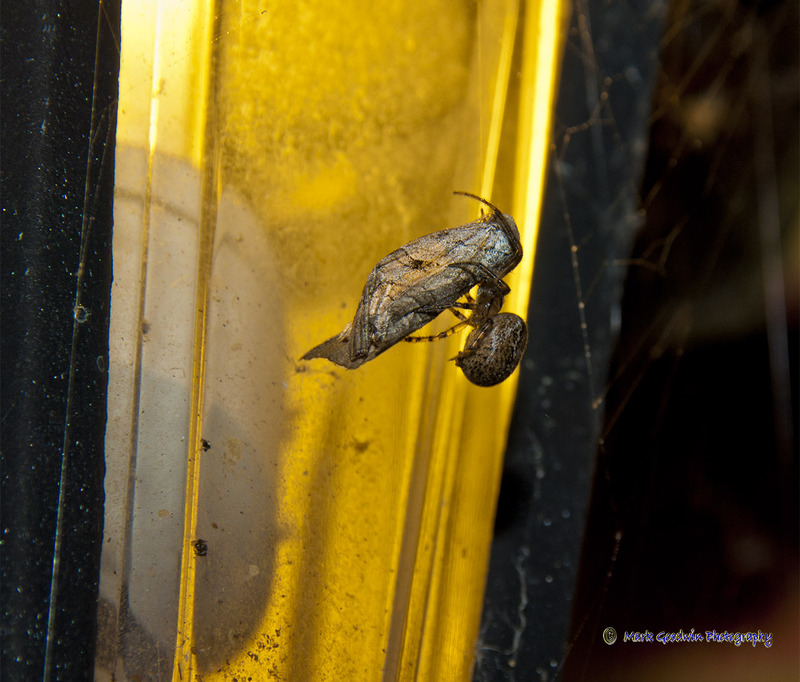 However, whilst in the garden I did notice a moth kinda hanging in a funny shape, from my outside lantern light. 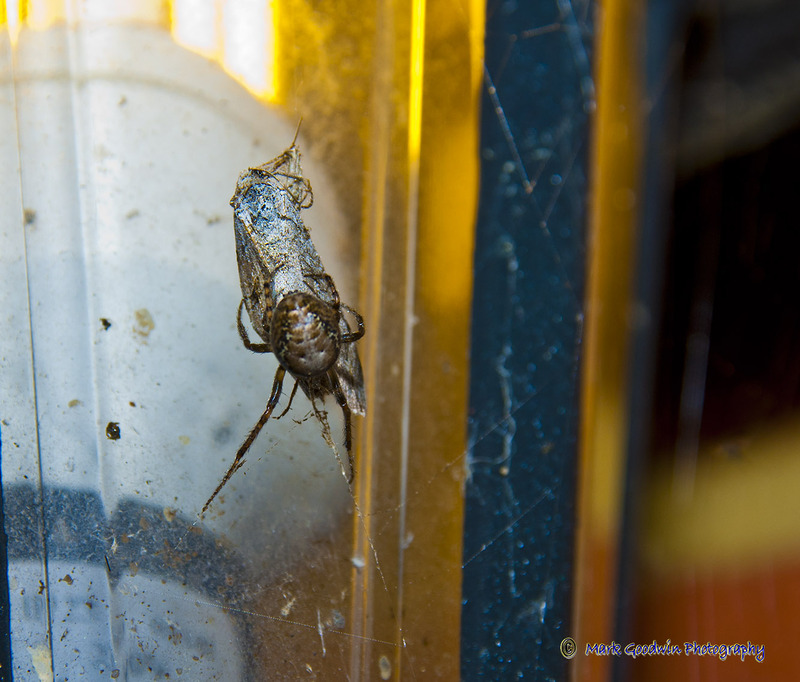 On further inspection I realised that the poor thing had been caught in/on a spider’s silk. 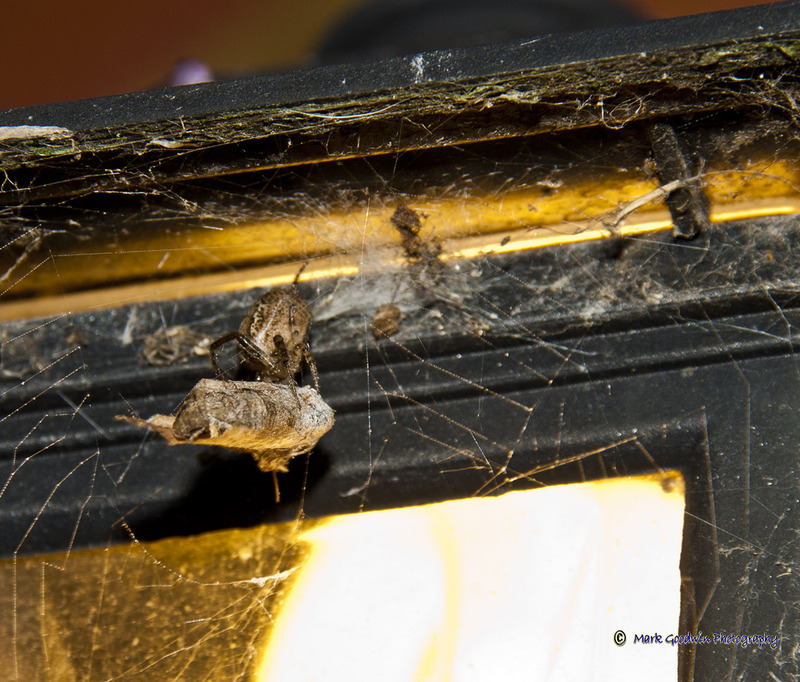 No sooner had I got close enough to try to identify the moth, than an Orb Spider came belting down from the top of the lantern to the moth, to ensure I didn’t nick it! I must have spent the next 30 or 40 minutes just watching the clever creature, prepare the moth. 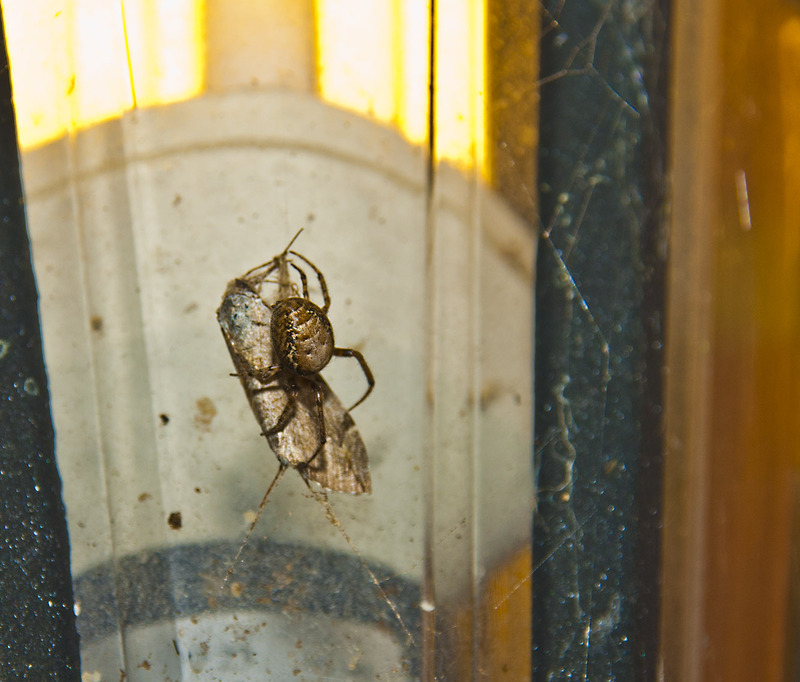 It spent its time very carefully and meticulously wrapping the moth up in silk as if it was a joint of meat. 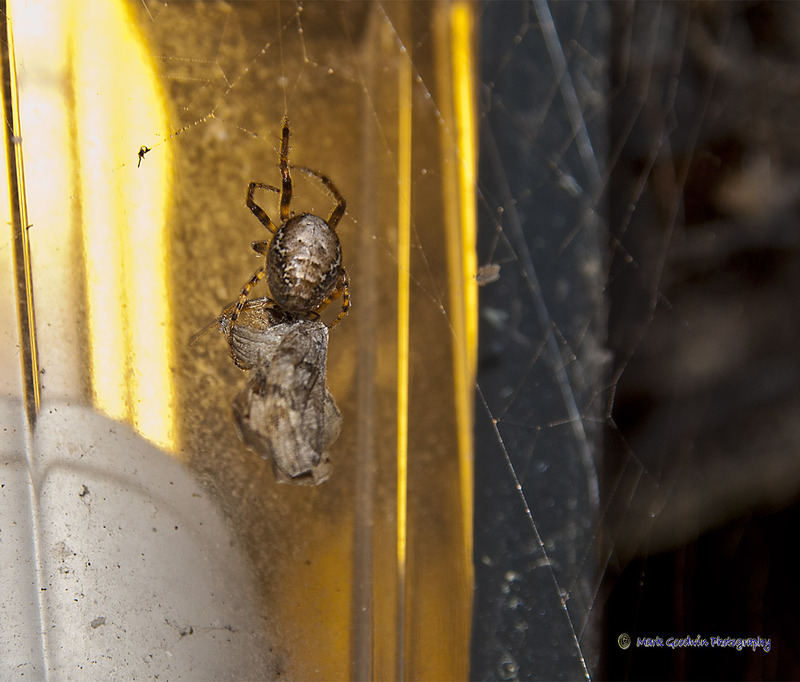 It appeared to take for ages, and meanwhile I was trying to get shots of the process against the background of the bulb in the lantern. 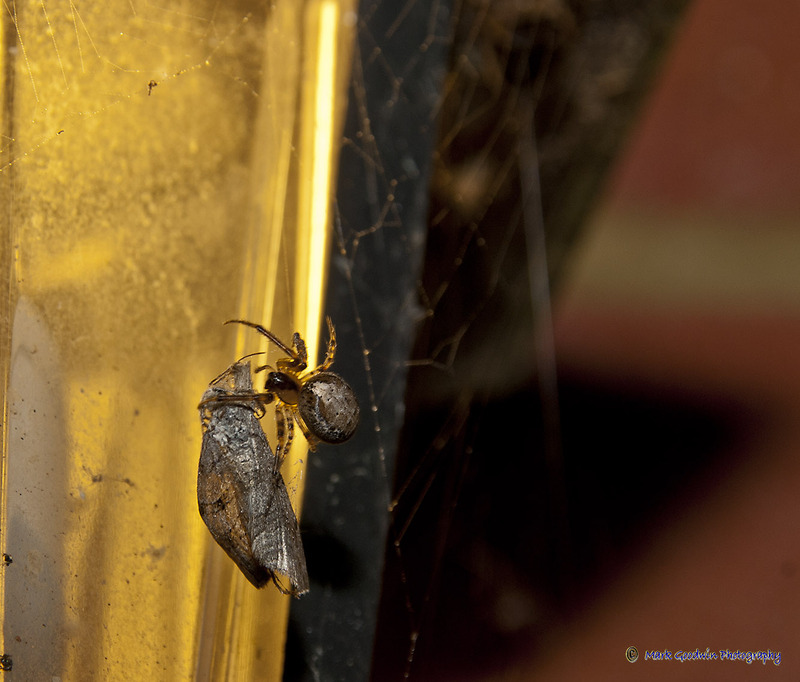 Then suddenly…almost in a flash the spider ‘ran’ up the hanging silk carrying the package with him. 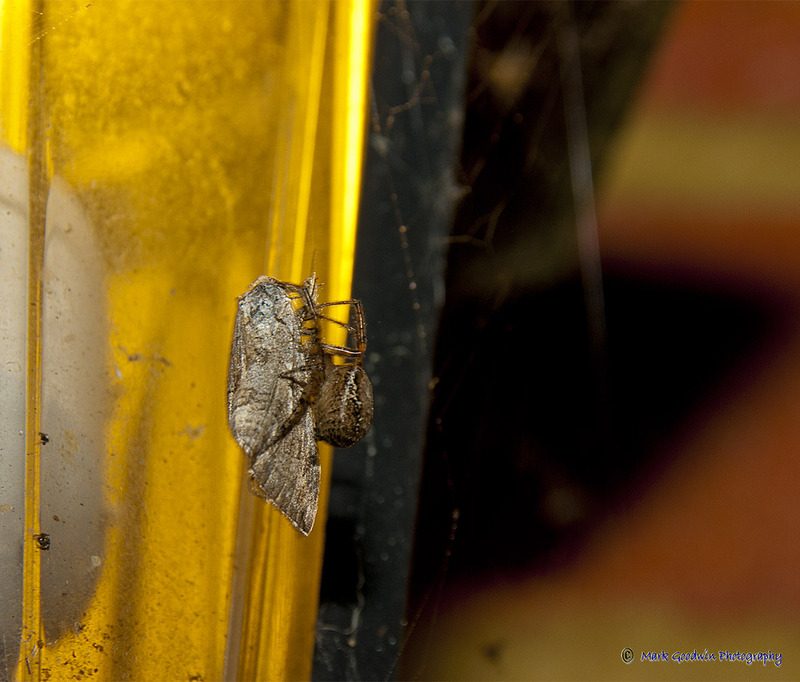 I was so surprised how strong the spider was that he could dash up the silk to its ‘lair’ carrying this lump. 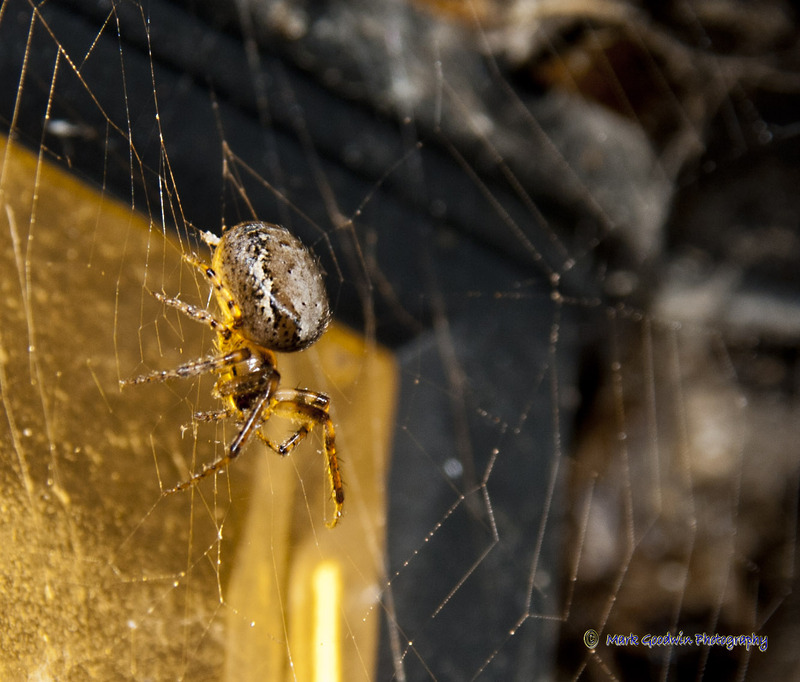 Here are some pics, not as good as I would have liked but the lantern light was giving me problems….at least that’s my excuse. And finally, get the shopping home and into the larder. Allowing the Garden to go back to the wild? Three years ago we downsized to a nice small modern house. The only thing we didn’t particularly like was the garden. Mainly because for years we had always lived in properties that were close to nature. However, this property had a ‘Designer’ garden, with paviours, raised beds with chipped slate and a fountain! But nothing to attract insects etc. Now some people may like this and I am not knocking them, good luck to them but it’s not for us. So this year I took the decision to just make a start, and to stop keeping everything so ‘tidy’. I made a start on the raised bed with the fountain. Got rid of the fountain (it didn’t really work anyway) and the slate and just left it to see what will happen. Consequently since the Spring this year weeds have proliferated including stinging nettles, Ragwort and some strange plants cropping up from the spillage of the bird seed from the bird-table! 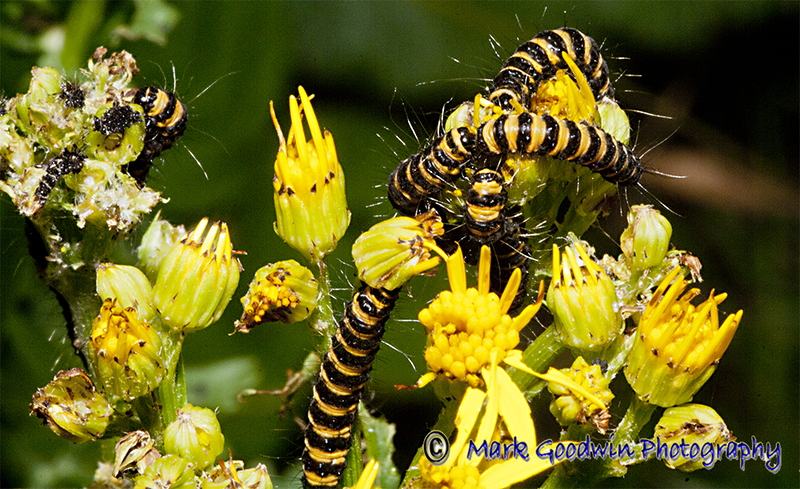 Imagine my surprise when I spotted on the Ragwort 25 black & amber striped caterpillars. 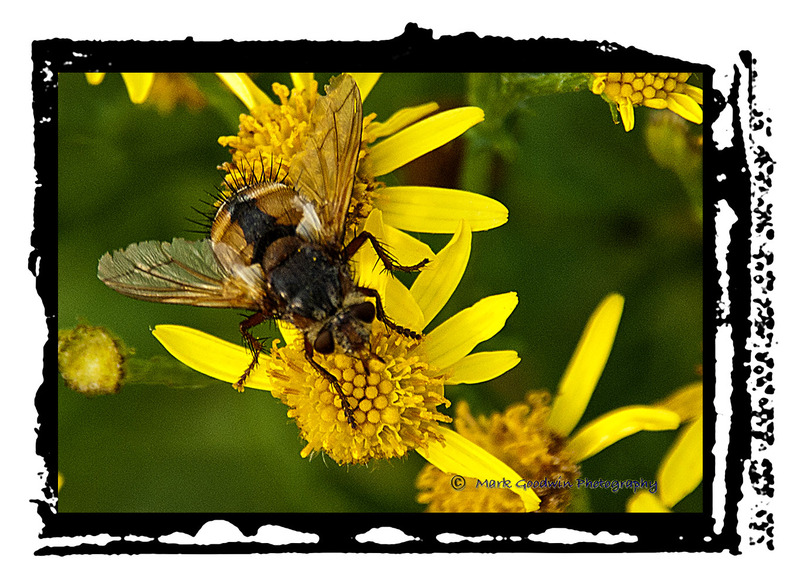 They are of course poisonous – mainly, as I am informed – because they eat the Ragwort which is in fact poisonous. The bright black & amber stripes warn other animals not to eat them. 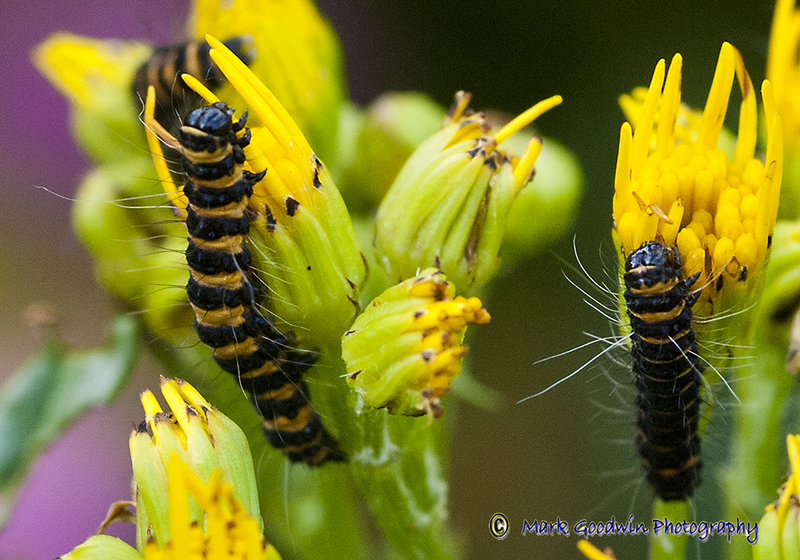 They are of course the larvae of The Cinnabar moth. So, I think this is a good start, and each morning I eagerly rush out to the garden to inspect my new little family who are slowly devouring the flowers of the Ragwort. So far they are all still in place albeit slowing down a bit and moving down the plant to what appears to be a ‘resting’ place snuggled up on a nice broad leaf. I intend to keep a watchful eye on the and hopefully photograph their progress. 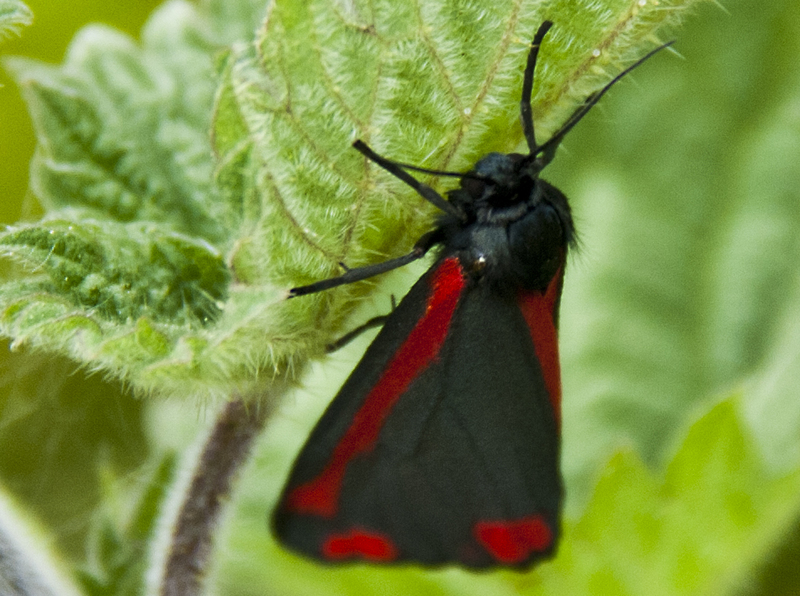 The photo below of the fully grown Cinnabar moth is from another day and another site, not in my garden, I have included it here because I think it illustrates nicely the metamorphosis.